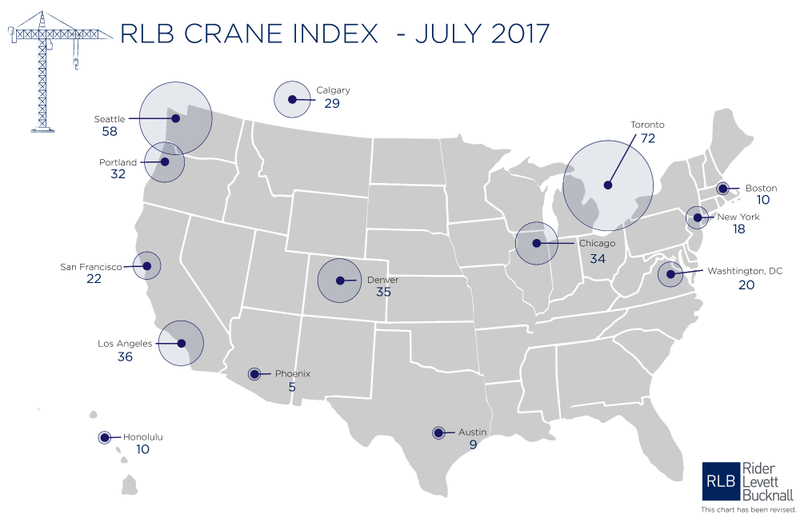 The latest “crane index” report from construction industry tracking firm Rider Levett Bucknall (RLB) reveals the ongoing construction boom across the American West, as the region’s major cities see broad increases in the number of cranes on the ground. RLB’s biannual skyline count has tallied nearly 400 fixed cranes in operation across the U.S. and the Canadian cities of Toronto and Calgary. Toronto topped out the list, overall, with 72 cranes in operation. Seattle fell one spot to second overall, with Los Angeles, and Denver, Colorado—tallying 58, 36, and 35 cranes, respectively— rounding out the top three American cities on the list. Chicago; Portland, Oregon; Calgary; and San Francisco follow closely behind with the list with 34, 32, 29, and 22 cranes each. Seattle’s count has held steady from the last report in October 2016, when the city first captured top ranking. The cities of Calgary, Denver, Los Angeles, and Portland, according to the report, saw increases while crane counts over the period since, with counts for Boston, New York, Phoenix, San Francisco, and Toronto remaining the same. In Seattle, the city’s emerging Denny Triangle neighborhood and regional growth associated with recent upzoning measures aimed at alleviating the regional housing crisis there helped to keep the city’s crane count high. Wolfstreet recently reported that an estimated 67,507 apartment units are in various stages of development in the city. In Los Angeles, meanwhile, a city-led push to add 8,000 hotel rooms to areas surrounding the Los Angeles Convention Center is responsible for many of the gains there, as several projects like the Gensler-designed Metropolis, Fig + Pico, and 1020 Figueroa developments climb out of the ground. High rise developments going up in surrounding downtown areas, as well as the ongoing construction of the new Los Angeles Rams National Football League team stadium by HKS Architects, account for some of the other gains. Overall, the RLB report cites strong growth in residential construction as an overall driver for the general increase in cranes across the region. RLB’s next report is due January 2018.